We've confirmed our plans for the club Christmas event to be at The Five Bells in Harmondsworth on Wednesday 20th December. We will have the Club's traditional mile event from 18:00 - Steve Newell will be measuring the course to ensure that it is the same length as the old Parkway Mile course and confirming that the air quality is at least to the same high standard. Then from 19:30 we'll be in The Five Bells with a Christmas Buffet - we may charge a small fee (say £5 a head) to upgrade to a better quality of Mince Pies. I've set-up a Facebook event for this with a nice picture of us on the beach https://www.facebook.com/events/353247041804420/ . Also don't forget to fill in (or complete) your survey responses at https://www.surveymonkey.co.uk/r/ZRNWX6K . A few people started but didn't finish - perhaps put off by the SurveyMonkey interface graying out the question. The club committee will consider the responses next week. PS - I remembered to fill in the survey myself yesterday! Oh and a final reminder that the retired runners lunch is on 5th December and anyone who hasn't told Steve Newell that they want to come should do so without any further delay. 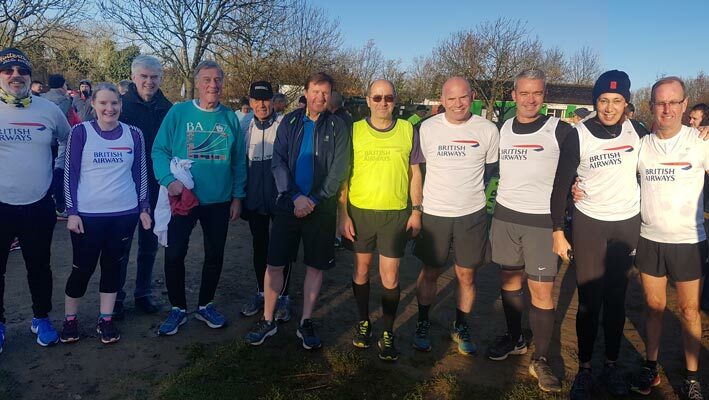 After pathfinding runs at Bedfont and Cranford earlier in the Autumn, the Five Mile Handicap series saw a more routine run on 22nd November. Old Age, injuries and shift-work reduced the field to four runners who completed the full course. There are still four rounds remaining and with the best four scores to count it is not too late to join in and still win. The next run is scheduled for Wednesday 13th December at Cranford. Availability of changing rooms and showers on that day will be included in the the Digest on 11th December. It is a long way off but the 2018 WARR is already open for registration. Visit the WARR website to register: http://worldairlineroadrace.org/ . Prices are 50US$ for the races and 60US$ for the awards evening. Charges are non-refundable but can be transferred for $3.95. September 22nd 8:00 AM DST - Renton parkrun and opportunities to explore the Seattle area. This is my pre-WARR parkrun plan. September / October - Kite surfing opportunities - Victoria is one of the best kite surfing spots in the world and our former colleague Daniela Mayerova, who now works for a kite surfing company, expects to be there and should be able to offer inside information and offers on local kite surfing schools. October 1st 6:00 AM MDT - Rocky Mountaineer Train Departs from Vancouver - this is a WARR special for a five day train tour across the Rockies from Vancouver to Calgary - see: http://worldairlineroadrace.org/news-and-events/things-to-see.... Not cheap, but perhaps a good rate on a once-in-a-lifetime activity. I've registered for this. There is also a two day option which is cheaper, but poorer value. October 7th - Victoria Marathon (with relay event plus half marathon, 8k road race and kids run) - see https://www.runvictoriamarathon.com/races/ . Piers Keenleyside has already entered the Marathon. there is one in the same park so you could parkrun, have breakfast, go Xmas shopping in Croydon and get back in time for the race. For those unfamiliar with the venue or with sat. navs. CR0 4RW is the postcode for Roundshaw Downs near the start but if you are coming from the Epsom direction you may wish to park near SM6 9DZ(only a short walk away). Saturday was the third time that the club has had a featured parkrun at Bedfont Lakes. So how have we done over the years? The table and graph gives you the answer - note that I've included performances for runners who are NOW members of the club even if they weren't then. 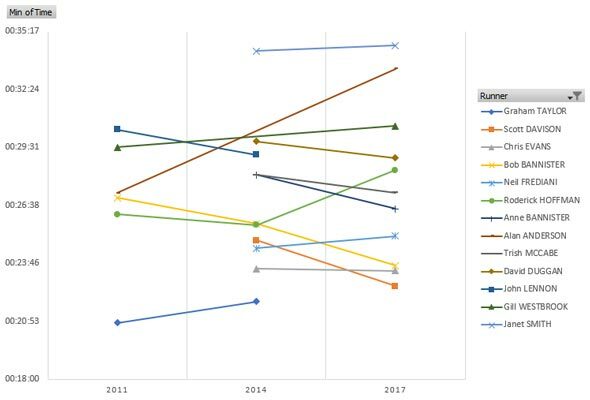 As you can see it hasn't all been downhill - at least as many of us have improved as have got slower and Bob Bannister ran his all time parkrun PB on Saturday on his 292nd run, his 247th at Bedfont Lakes. Bob was also too quick for the photograph! Don't forget that you'll be able to get some additional parkruns under your expanded belt this Christmas time. On Christmas Day you can get a run in before driving home for Christmas with the family. Amongst many others venues include Northala Fields (I'll try to give you a goodtime...as time keeper on the day), Bushy, Woodley and with 9:30 starts both Homewood and Fulham Palace. On New Year's Day they will crank up the parkrun computers another notch or two and enable you to record TWO different parkruns in the same morning. Start times are staggered to make this possible (and to confuse those still staggering from the previous night's celebrations). New Year's Day is a good opportunity to visit parkruns the other side of London without being on the road to hell in traffic on the way home. My challenge as always is to find two parkruns I've not yet run that are both near to each other and with differing start times. Currently I'm seeing Castle Park (start time 08:30) as a good candidate for my first run of the day and year. Not all parkruns have yet declared whether (and when) they are operating on these two dates - as well as needing to ensure they have enough volunteers they may need to get permission from councils and other organisations. Of course these parkruns are in addition to the regular Saturday parkruns. If the weather turns, remember to check the cancellation lists - perhaps as the last thing you do before setting off. Last Saturday the wet and cold spell caused the cancellation of 58 UK parkruns. Next Saturday Louise Plank is planning her 100th run and has arranged for a £10 donation to a defibrillator fund for Pitshanger junior parkrun for every runner who is a first timer at Gunnersbury. So if you've never been to Gunnersbury before, think about it, you could be extending some young life in the future by decades. The exercise has been labelled as the...wait for it...Plank Ton. The Perivale Five may be full up but there is time to get a registration in for another popular run in the area - the Harrow Hill 10k road race. If you enjoy long downhill runs then this could be a race for you although be warned that whatever comes down must also go up and in the case of the Harrow the up comes first. 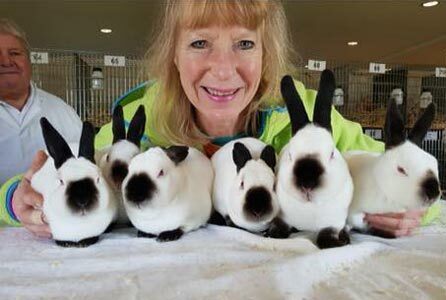 Ed: The photograph shows six Himalayan Rex rabbits. If they are from the Himalayas perhaps they would have coped well with the parkrun conditions? Sun.26th Nov. at Battersea Park with a 8.30AM start (OUCH!) Julie Barclay/Paul Watt ran the Self Transcendence 10k around the nicely tarmacked path of 4 laps. A well organised and recommended event. With 3 weeks slightly increase in training both aiming 10min laps for a PB. The final lap being 400/500m longer Julie had a brilliant run to achieve a life time best of 42.45 (previous best being 43.28 at WARR Chicago) also today finished 1st 0/50 with age graded 84.5%. Paul on target after the third lap but said he was losing his pace rapidly over the final lap to finish in 44.50 (69.6%). His best being 44.28 so obviously disappointed but will return after a rest.